The first important day i.e. the day of birth is important because without birth the story of the person will not begin, we are blessed with a human life. However, many people simply get born and vanish one day after living like any other living creature including insects. 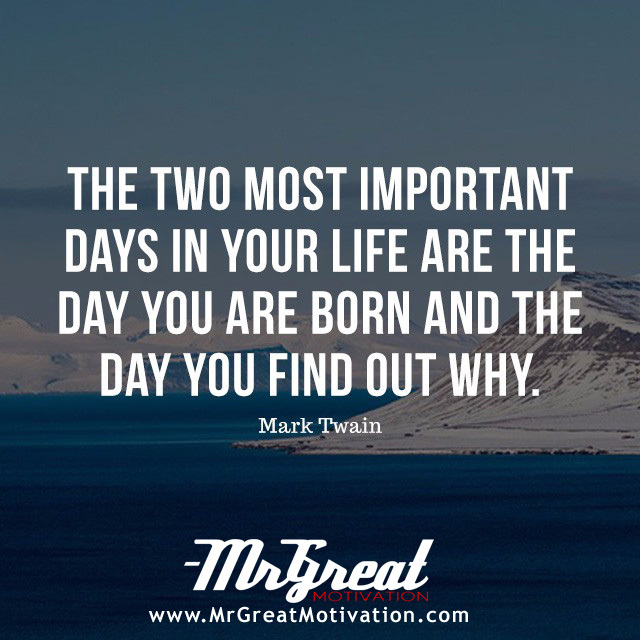 It is important to know "why we are born." What is the purpose of our human life? In case we are not able to know the purpose of our life, then our life is as good as the life of a creature. The day we acquire knowledge of the truth of life we are said to be born twice. Life is a recreation we endure, it starts on the day we are born, but it takes time to experience to figure out why? What you are doing while you are here on this earth. We all have hidden capabilities and great motivation in us but because of the fear that what will other say or think we never try to explore it. We all are here for a goal in life to give back something to this civilization and to the spirits of this world and if we don’t take responsibility of that anybody else could not take it because the talent you have and the great motivation with that talent what you can share with this world is priceless. We hope guys you find Quote "The two most important days in your life are the day you are born and the day you find out why. - Mark Twain" by Mr Great Motivations useful. If you think we have made some efforts, then don't forgot to appreciate us by sharing this Quote with your friends and family, And thanks for visiting.